The heart of the storage solution for 24 hours of sun. With power categories from 3.0 to 5.0 kW, the three-phase inverter allows Surplus energy from a photovoltaic system to be temporarily stored in the Fronius Solar Battery. The builtin Multi Flow Technology enables the energy flows to be intelligently managed. 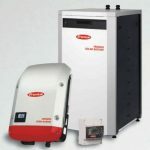 The Fronius Symo Hybrid allows any surplus of a photovoltaic system to be stored in a battery. The result: maximum self-consumption of the available power as well as maximum energy indepen-dence. The Advanced Grid Features (AGF) incorporate a range of functions that support reliable grid operation. They prevent grid faults and unexpected failures leading to yield losses. In line with new guidelines for energy fed into the grid, these features can be activated at any time.